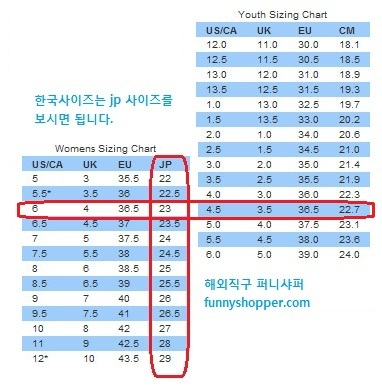 탐스 슈즈 패밀리 세일로 정상가 제품 20% 할인쿠폰입니다. 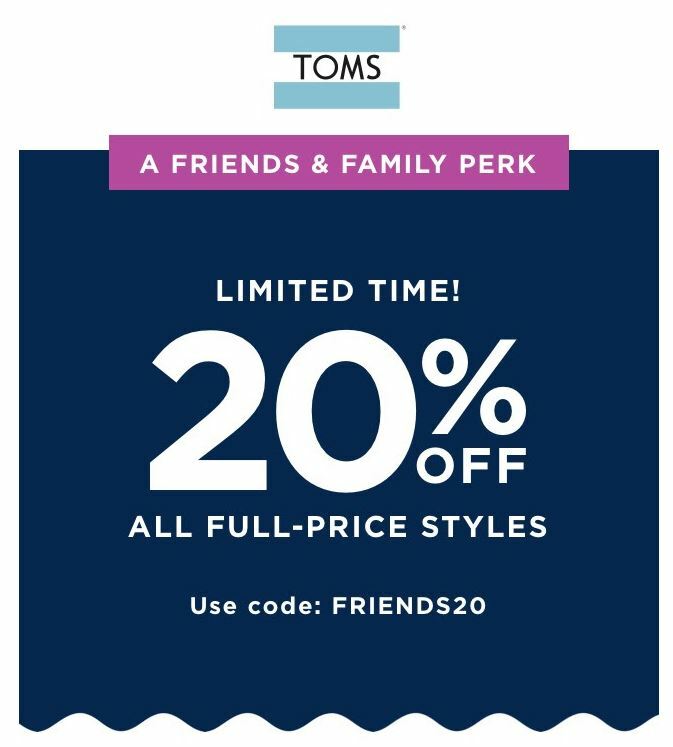 *20% off full-priced items from TOMS.com from 8:00 pm PDT on May 22, 2018 through 11:59 pm PDT on May 24, 2018. Offer does not apply to markdown items, gift cards, taxes, shipping or any other fees. Cannot be combined with other promotions, offers or discounts (other than any shipping promotions that may be in effect). Offer not valid on previously purchased merchandise. Please enter promotion code FRIENDS20 upon checkout. Offer is subject to adjustment due to returns, cancellations or exchanges. 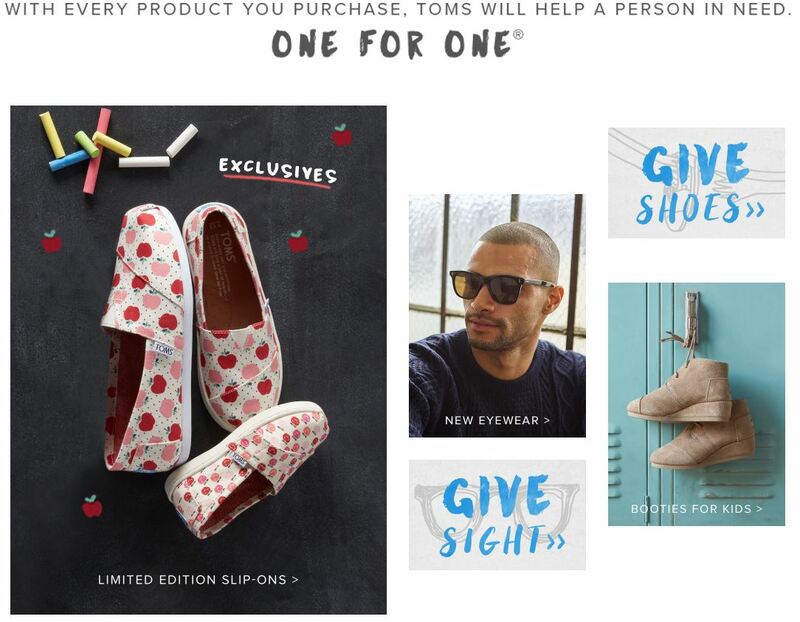 TOMS Shoes, LLC reserves the right to extend, modify, or discontinue these offers at any time. 탐스 슈즈 $59이상 프리쉽입니다. 키즈 신발은 금액 상관 없이 무료배송되구요. Free shipping on purchases of $59 or more. *Free shipping valid on orders of $59 or more placed on TOMS.com from 12:00 am PDT on May 1, 2018 through 11:59 pm PDT on May 31, 2018. Minimum purchase amount does not include the purchase of gift card(s), taxes, discounts or any other costs or fees. This offer is only valid on orders shipped to the continental United States with UPS Economy via SurePost only to one shipping address. Choosing any shipping method other than UPS Economy via SurePost may result in normal shipping and handling charges. Offers not valid on shipments to Alaska, Hawaii, international shipments or other shipments outside the continental United States. No promotional code is necessary; offer will automatically be reflected in your shopping bag. Offer not valid on previously purchased merchandise. TOMS Shoes, LLC reserves the right to extend, modify, or discontinue this offer at any time. Please see Shipping FAQs for further details. Free shipping on all Kids' Shoes. *Free shipping valid only on all Kids' shoes on TOMS.com/kids from 12:00 am PDT on May 1, 2018 through 11:59 pm PDT on May 31, 2018. Offer does not apply to any other products, including gift cards and backpacks. This offer is only valid on orders shipped to the continental United States with UPS Economy via SurePost only to one shipping address. Choosing any shipping method other than UPS Economy via SurePost may result in normal shipping and handling charges. Offers not valid on shipments to Alaska, Hawaii, international shipments or other shipments outside the continental United States. No promotional code is necessary; offer will automatically be reflected in your shopping bag. Offer not valid on previously purchased merchandise. TOMS Shoes, LLC reserves the right to extend, modify, or discontinue this offer at any time. Free shipping for Trailblazers in the TOMS Passport Rewards program. *Free shipping valid only for Trailblazers in the TOMS Passport Rewards program for one year. Offer does not apply to gift cards. This offer is only valid on orders shipped to the continental United States with UPS Economy via SurePost only to one shipping address. Choosing any shipping method other than UPS Economy via SurePost may result in normal shipping and handling charges. Offers not valid on shipments to Alaska, Hawaii, international shipments or other shipments outside the continental United States. No promotional code is necessary. You must be logged in to your TOMS Passport Rewards account; offer will automatically be reflected in your shopping bag. Offer not valid on previously purchased merchandise. TOMS Shoes, LLC reserves the right to extend, modify, or discontinue this offer at any time. Please see TOMS Passport Rewards FAQs for further details. **Free returns for TOMS.com customers within the continental United States. We accept items that are unworn, unwashed and unaltered purchased directly from TOMS.com that are received by us within 30 days of your order date. Please account for the time it takes for the carrier to ship your item(s) back to our warehouse in Mira Loma, California. Gift Cards (both physical and electronic) and other items marked "Final Sale" are FINAL SALE and are not eligible for return. Please see How do I return an item? for further details. 탐 스슈즈는 고객이 탐스슈즈 1켤레 구매할 때마다 신발이 필요한 아이들에게 탐스슈즈를 1켤레 기부합니다. 그리하여 여러분의 소중한 구매가 백만명의 아이들에게 신발을 전달해주었다네요. 탐스의 정신과 탐스를 신는 당신의 정신이 신발이 없는 아이들에게 신발을 줍니다. 빌링주소 맞는 지 확인한다네요. 변태페이팔로 결제를 시도하시거나 결제대행 또는 TOMS 상품권을 이용하셔야 겠어요. 퍼니샤퍼의 저작물은 퍼니샤퍼의 저작권물이며, 기본 저작권은 글쓴이에게 있습니다. 출처를 밝히지 않은 복제, 원문의 텍스트, 이미지, 링크 등 원작을 훼손하는 행위에 대해 법적 조치를 취하게 됩니다.